Events are planned in 2018 to celebrate the milestone and honor Rose Nierman’s vision. "Nierman Practice Management has been a staple in the dental industry for three decades." 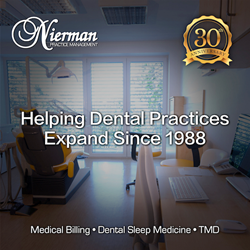 2018 marks the 30th year anniversary for Nierman Practice Management, an industry leader in dental-medical billing, dental sleep medicine, and TMD implementation solutions. This milestone is an exciting achievement for the company, whose mission to help dentists implement medical billing began over 30 years ago with the vision of founder/CEO Rose Nierman. Today, Nierman Practice Management, with a team of over 35 employees, is one of the largest resources for helping dentists receive medical insurance reimbursement. Based in Jupiter, FL, Nierman Practice Management began operations in 1988 when Rose realized the potential of billing medical insurance to help dental patients. She wrote the first manual on dental to medical billing, “Successful Medical Insurance in Dentistry” and began lecturing and consulting to dentists nationwide. In 1991, Rose developed the first dental software to generate and streamline the necessary forms and paperwork required to bill medical insurance. This transformed the industry of medical billing in dentistry and set the tone for the years to come. “Rose has really made it easy for dentists to understand the necessary steps, requirements, and process to bill medical insurance for our patients. Her software and support is unlike any other. Nierman Practice Management has been a staple in the dental industry for three decades,” stated Mayoor Patel, DDS, MS; a long-time Nierman client. Nierman Practice Management has many events planned in 2018 to celebrate the milestone and honor Rose Nierman’s vision, team, and dedicated clients.